In recent years the BBC Legends label has issued a number of broadcast performances by Jascha Horenstein, not least an unforgettable account of Das Lied von der Erde. These have confirmed what a fine, often inspirational Mahler conductor he was. Sadly, he left very few studio recordings of Mahler symphonies, though his marvellous 1970 recording of the Third for Unicorn-Kanchana has long been regarded by many expert judges as one of the best. He also made a recording of the First for the same label in 1969. I have not heard that but it was highly commended by Tony Duggan in his survey of the symphonies (link). In that article Tony makes mention of an earlier Horenstein traversal of the work, then on the Vox label, and this is that same recording, now re-packaged and under a different imprint. According to the notes accompanying this CD it was with this symphony and this self-same orchestra that Horenstein made his debut in 1924. One imagines, therefore, that this was a work that had some especial significance for him. Unfortunately this recording doesn�t really show him at his best. The first movement seems to me to lack just that last but vital bit of tension. Furthermore there are passages in this movement where the music really should burst out in an abandoned way but the performance doesn�t really convey that sense of outgoing freedom. I realise, of course, that this is a heavily subjective view, which others may not share but for me there�s just something missing. The two middle movements fare rather better. The sturdy rustic nature of the ländler comes across well. The slow movement is quite good too and the passage (between 5:40 and 7:58) where Mahler quotes from the last of the Lieder eines fahrenden Gesellen is affectionately phrased and nicely played too, though this is one of many passages where one feels that the horn section of the VSO is living on the edge! The eruption with which the finale begins shows only too clearly the limitations of the recording. The exciting loud stretches of this movement proceed on two levels. Superficially the excitement is provided by the brass-dominated fanfares. However, it always seems to me that the real excitement is provided by the driving string figurations that underpin so much of this music and goad it inexorably forward. Unfortunately, the VSO strings don�t really dig deep enough here � or can�t be heard so to do. In addition, it�s in these frenetic stretches that the fallibility of the VSO�s playing, and that of the brass in particular, is most exposed, as Tony Duggan so justly observed. The great passage, beginning at 4:19, where Mahler unfolds a gloriously long-breathed melody in D flat major is eloquently done but the strings don�t have at their disposal the last ounce of ardour that is needed to make the climax of this passage (at around 6:00) really tell as it should. These technical shortcomings are not the only reason why I find myself underwhelmed by this reading of the finale. There are two or three points where Horenstein piles on Mahler�s already strong rhetorical tone by pulling the tempo back excessively (for example around 10:00 and again at 18:20, just before the final apotheosis.) These are disappointing lapses of taste. The coupling of Lieder eines fahrenden Gesellen is an apt one since Mahler quotes from two of these songs in the symphony. Norman Foster is an excellent, eloquent soloist who sings with real feeling and understanding and Horenstein, supported by a better orchestra, proves to be a supportive and perceptive accompanist. Both singer and conductor convey well the innocence of the second song, �Ging heut� morgens übers Feld�, which is quoted in the first movement of the symphony. Foster employs an almost Wagnerian sense of drama in the opening pages of the third song, �Ich hab� ein glühend Messer in meiner Brust� but later he reins his tone back sensitively and appropriately for the more withdrawn passage beginning with the words "Wenn ich in den Himmel seh" (from 1:16). Foster�s assumption of restrained but genuine sadness in the final song is impressive. He does particularly well in the episode that provides the quotation in the third movement of the symphony ("Auf der Strasse steht ein Lindenbaum"), beginning at 2:50. This is but one of many passages in the cycle where the tessitura lies demandingly high but Foster takes it all in his stride. So the performance of the songs is very satisfying and the sound quality is better overall that that of the symphony. 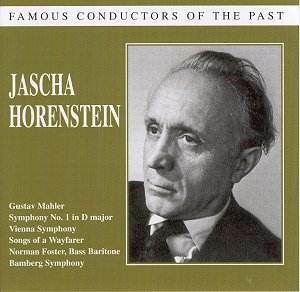 However, the recording of the symphony is by no means so recommendable and I for one shall follow Tony Duggan�s advice and try to hear Horenstein�s later account of this work in preference to this earlier one.